Anyone involved with website design today should be aware of the extremely large number of changes being released for the open-source platform of WordPress. 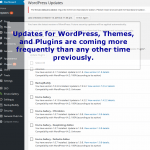 This includes updates for thousands of WordPress’ associated plugins and themes. WordPress enhancements are being delivered at a record-breaking pace. It seems the update rate is almost weekly. Many designer and developers are having trouble keeping up. These updates consist of security updates to bug fixes to new features to profound overarching architectural changes to WordPress such as an application API of JSON REST. Hence, new website development must include the capability to easily incorporate updates without disrupting the current website’s performance or operation and allow a website to endure and grow with new functions if desired. 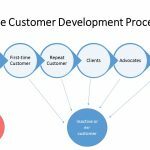 For me, website development begins with the discovery the marketing requirements to solve a customer’s problem and achieve business goals. Before a new website is designed, a thorough analysis must be performed to understand the business needs and requirements of the website. This is the most important part of a website development. The design of the website takes a backseat to the primary function of content delivery, to create and deliver the right messaging to invoke action. The first priority of the website is content delivery by providing information sought by the target audience. The website purpose is to achieve business objectives. The website itself is only a platform base or pedestal for content delivery. The website as pedestal must be reliable and consistently contribute to the function of content delivery. Starting with the concept design phase, websites must be developed to be modular, extremely stable and upgradeable. Serviceability and maintainability have become a key issue to preserve the customer’s website investment by lower costs for the long run. 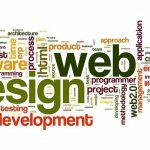 Website developers should be using a pedestal made with the most advanced infrastructure of technology available that will allow integration of future version changes and updates. The new website design must use a “well-thought out architecture” with a layered structure. The website pedestal must be built on a stable framework of reliable components with the mechanism to optimize code execution using defined interfaces to add robust functional features economically. My approach leverages the pedestal to ensure the website is at the latest level with quality software. To me, it’s inconceivable and strictly wrong to even think of developing a website otherwise. Some developers use an approach by code hacking by trying this and that, the results are websites waiting to break. A strong infrastructure is a full function pedestal for content delivery and can be easily updated with little risk of adverse effects. There is a profound elegance of creating a new website that’s both simple and powerful. My approach relies on the reusable framework of Genesis, where most of the development planning and information organization is already done. Before the design begins, it reassuring to know I am using a proven infrastructure that’s very popular, used by thousands of websites and is continuously being updated by a team of smart and experienced developers. My approach relies on deploying a fully supported and operational pedestal. If this infrastructure didn’t exist, it would take literally hundreds of thousands of dollars to develop it from scratch. Fortunately, the pedestal of WordPress and Genesis does exist as open-source products. The core competency I bring to the table is the expertise of marketing management. new product development and my ability to create content using the right pedestal that’s regularly updated. During of my career, I have developed and launched a long list of products. I develop websites the right way using the right pedestal and my experience. I have spent a consider amount of time evaluating and studying different infrastructures. The Genesis Framework is the best. It provides the light-weight simplicity, popularity, a large install base, robust functions, and is regularly supported with updates that align with WordPress. Genesis sits on top of WordPress. WordPress is constructed with a proven architecture using the most advanced technology and is being improved every day. Over 74 million websites are built with WordPress. It’s the most popular user-friendly Content Management System,(CMS) on the Internet. 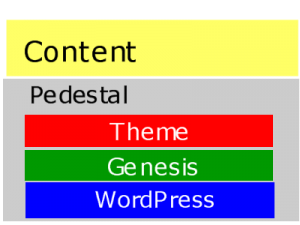 I use WordPress with the Genesis Framework as my strategic infrastructure or pedestal. The pairing of WordPress and Genesis is a powerful combination of value that will preserve your website investment. Website designers that create unique themes make beautiful websites. But, they are many times afraid to update them to newest level of WordPress. The one-of-kind designed theme sits directly on top of WordPress and may interact the wrong way when updated. If a problem occurs the website has to remain back-level until the theme is fixed. Thus, uniquely designed themes that sit directly on WordPress mean more efforts needed to overcome adverse effects of updates and keeping the website from becoming obsolete. In contrast, my approach (using pedestal composed of a “layered architecture” with the Genesis Framework), will greatly reduce the risk of adverse effects when updating WordPress. Please note, Genesis updates are tested with the corresponding new level of WordPress before being released. This can significantly reduce of risk of adverse effect. In addition, it will greatly minimize the effort of the individual designer to accomplish updates easily. In summary, website development should be based on 2 distinct parts a pedestal and the content. The pedestal must be a reliable layered infrastructure that furthers your ability to deliver content. For more information regarding my approach and how I can help you, please call me on (813) 732-7312 or send me an email.